How much, do I love Sirri 1ply? It's uneven, slightly overspun and reeks to high heaven of sheep. It's absolutely fantastic. Oh, I LOVE it. I pulled out my hibernating Aestlight shawl last night. I started it over the Christmas holidays last year and it was promptly put into hibernation on Boxing Day. 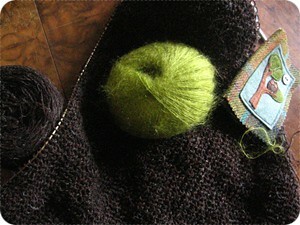 I now remember why: I find all the garterstitch deadly dull. I now have to decide whether to pull out all that garterstitch or find some inner backbone to get those last twenty rows done before I pick up stit... aghr, I think I'll just call it a day. The Kidsilk Haze in Jelly was just sitting randomly on our kitchen table. I really like those two colours and textures together. Hmmm..
Also on the kitchen table: my needle book made by Chookiebirdie, aka Lorna Reid. This little book has kept me company for a few years now. I have visited Lorna's studio many times (she is just a few doors down from my very good friend, Ms Old Maiden Aunt) and eventually decided that I would love her to make me a small needle book. 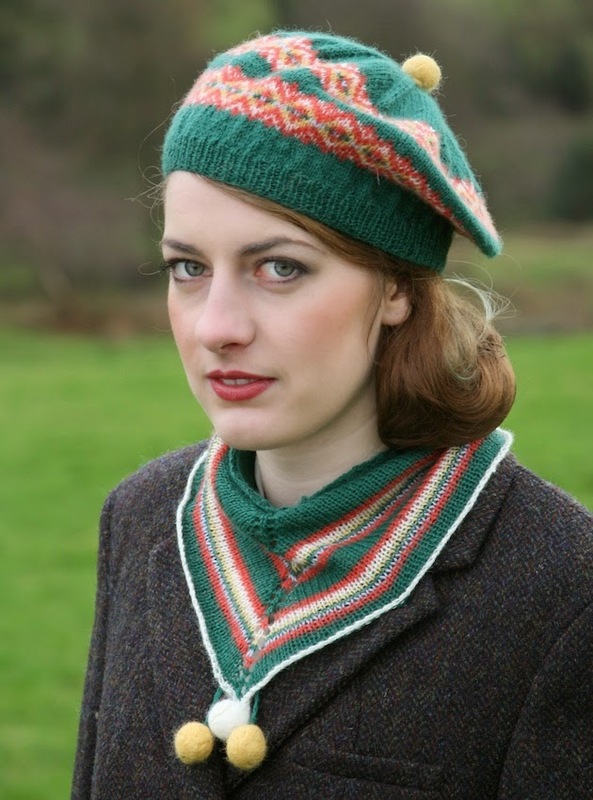 I did not give Lorna many guidelines - just that I loved moss green. 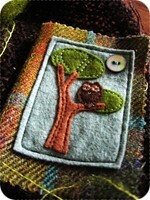 Lorna promptly delivered this lovely needle book: moss green and aqua and orange and an owl. Everything is so beautifully finished. I spot something in the background too. I wonder what that could be? I'll hopefully get you a proper shot of that "mystery object" later this week if the notoriously fickle April weather complies. For now, let's just say I cast off last night and I'm ever so slightly oh my word. The Art of Fashion. Exactly what it says on the tin. I could happily read an entire book on this topic. Most Underappreciated Films of the Last Decade: a nice run-down which provides inspiration for our DVD nights. Hugh Grant(!) - yes, that Hugh Grant(!!) - steps right into the fray with an excellent article about British politics, British media, Rupert Murdoch, whistle-blowing, and phone-tapping. A must-read if you have the slightest inkling what I'm on about. Hugh, I loved you in Maurice (especially with your moustache-of-repression) and forgive you for everything you've done since. This little girl knows her Star Wars (YouTube link) I especially like her bow and the Storm-Trooper's fist-pump. Made me grin like an idiot. And speaking of videos and me grinning like an idiot, let me recommend When Harry Met Sally 2. Does the very thought strike fear into your heart? You should be first in line to watch this. A linguist friend once told me about a second language acquisition theory: different people store languages in different ways. Some brains work like a giant filing cabinet: words, phrases, idioms and syntax are all neatly filed away so the brain goes to the cabinet, looks in the Spanish drawer, cross-references this with the English drawer and consults the syntax section before proceeding. Other brains have languages stacked on top of each other and perform advanced archaeological excavations every time they need to switch from one language to another. Guess which type of brain I have. Ten days in Denmark. The longest I have been back since my big move some four years ago. Today I was standing in my local supermarket wondering why an elderly couple was speaking Danish. As it turned out, they were not - but right now my brain automatically assumes background noise must be in Danish and I have to makes a conscious decision in order to recognise the language as Scots English. Likewise, I'm searching for words: what's English for parabolantenner or 'Bare på beløbet, tak'? I know these words, of course, but I have to dig deep before they pop into my head. Interestingly enough, I only have these problems with spoken language, not written. I'm sure there is a perfectly good (neurological) reason for this. However, I refuse to believe there is a valid neurological explanation for the way the Danish language is being mangled by people who really ought to know better. Danish is being invaded by English - and it is not even correct English in many instances. I have never been a militant language purist (the way I acquire and use language prevents me from being too holier-than-thou) but I think I am becoming an old grumpy lady. WHY write "den perfect carwash du altid har drømt om" when the correct phrasing would be "den perfekte bilvask du altid har drømt om". WHY WHY did my gran's woman's weekly write about "en crunchy banankage" when Danish already has several words meaning "crunchy" AND most of the magazine's readers do not understand English in the first place? WHY WHY WHY would a major national newspaper gleefully write "livet er one long bundy jump" in the middle of an interview with a Danish designer thus mangling BOTH Danish and English? I nearly cracked when I was sitting next to a bunch of Swedish golf-buddies on the plane back to Scotland who kept shouting "EXACT!" but I'm told that is a valid Swedish expression which admittedly feels a bit deflating after I've been foaming at the mouth since Monday night. Last day of my holiday today. 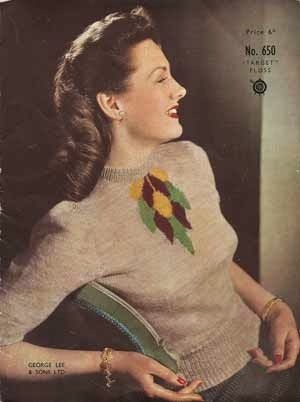 I shall celebrate with some knitting and some tidying. I finished reading David Mitchell's latest novel last night but I need to mull over it before writing anything about it.